Lots of programs available for kids of all ages. 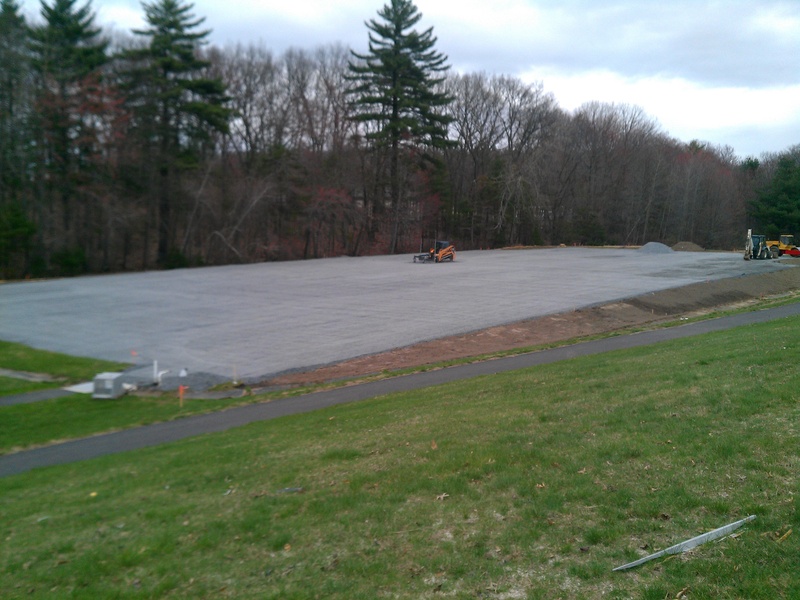 4/28/15: Construction is under way at A/V on the six courts. 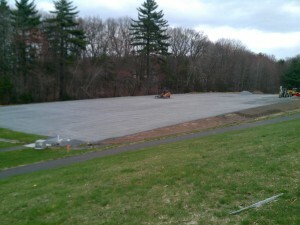 No word on completion, but they appear to be progressing diligently. Meanwhile, at Ward Park . 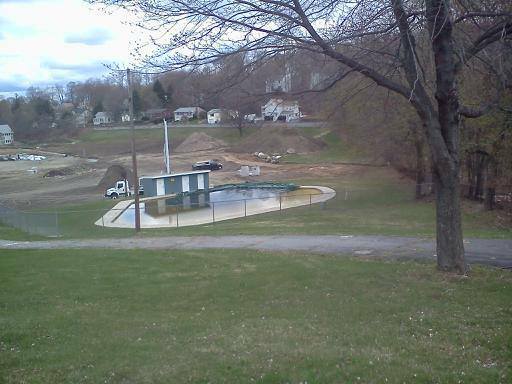 . .
4/27/15: No news as to the plans for the Ward Park courts which were bulldozed as part of the construction of the new Senior Center and drainage improvements and renovations to the playing field. We hope they come back! It has snowed once! 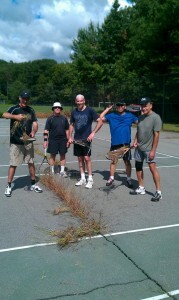 The race is on to see how many more games we can get in until the DPW truck shows up and the nets are gone. But there will be tennis until then! With the Youth Tournament going on, the Saturday morning Irregular Men’s League got bumped and went in search of a substitute venue. 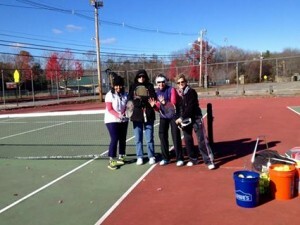 The new Marlborough High School courts appear to be padlocked, so we tried Assabet. We had to develop Jungle Rules about what happens when a serve disappears into a clump of grass, or when a forehand takes a crooked bounce in a crater, but it was, as they say, better than nothing. If the youth tournament is still going on next week, we’re bringing a weed wacker. Shown (l-r) are Will, Jay, Sean, Rowell, and Jim. Photo by webmaster Mike Tremblay. Who remembers the model name of this early metal racket? 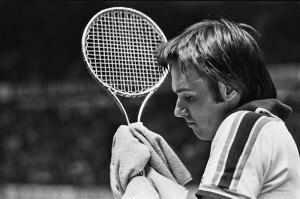 Jimmy Connors popularized it in the 1970’s, and kept using it until 1985. It had a unique string suspension method that made the ball spring off it, so it developed the nickname “The Trampoline” by the kids of the era at the Riverside courts. Post your answer to the message board. Prizes to be determined at the whim of the webmaster. 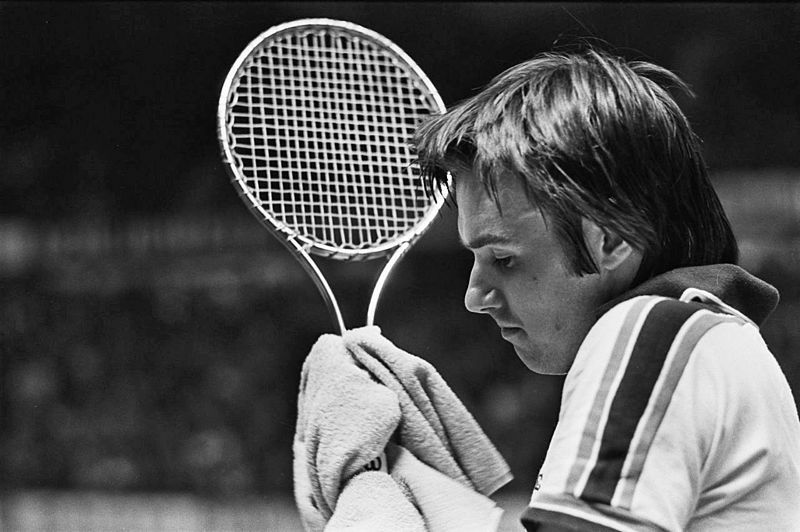 Hint: the “W” is visible under the towel, so “Wilson” will not be accepted as a correct answer. © 2017 HudsonTennis.org. This site is not affiliated with the Town of Hudson or Hudson Recreation Department.